Install deck extension and replace existing deck boards, railing, and stairs. Removed all existing wood decking, railings, and stairs and carted away everything. Dug additional piers and constructed new framing for deck addition, and added support to existing deck frame. Installed Azek decking and stairs, as well as Fairway vinyl railing system, with wood posts, covered with vinyl sleeves. Installed Azek deck board on top of railing, using Fairway deck board mounting hardware. Installed Dimensions PVC privacy lattice from bottom deck board to ground around edge of raised deck. After speaking with several contractors and receiving estimates from each, I hired Brian to do the work for several reasons. He is local to me, as I see his truck parked in his driveway when I go past his house, his price was competitive with other contractors, and primarily because he gave me the feeling of someone that I could trust to do the job properly.He had the materials delivered from a local building supply store and began work the next day, as previously scheduled. I hired him to expand the overall size of the deck approx. 2 1/2 times its original size. He was personally on-site each day that work was being done, and did the work himself, with the assistance of one other worker. He communicated well with us during the entire process and worked every day until the job was complete. He addressed my concerns and I was completely satisfied with his work. He always left the area clean and free of tools, materials, or debris. I think that his work is top notch and would, in fact have already, recommended him to others, including friends and neighbors.Throught the job, he made me feel as though he was doing the job the way that he would want it done, or would do it, at his own house. Brian’s exceptional carpentry work was well worth the price. 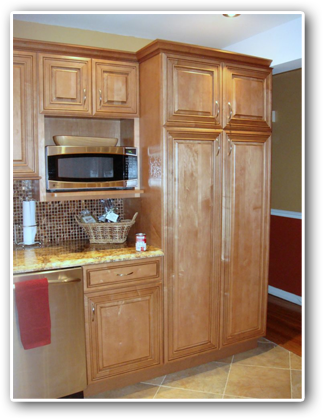 We put in a brand new kitchen with complete tear out and all new cabinets, sink and countertops. Brian helped us from picking out cabinets, countertops, sink, faucet and any other items we needed to get this project underway. When he said he would be at your house, he was there. He always showed up! when his day was done, everything was cleaned up and ready to go for the next day. We highly recommend this professional and talented man for any carpentry work you might have. 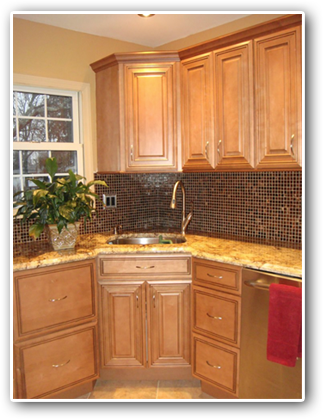 We cannot say enough about how pleased and satisfied we were with our kitchen remodel that Brian Gallagher did for us. The job was much more than a simple remodel. In addition to the installation of cabinets and appliances, there was a lot of construction including new doors, windows, trim and removing of a wall. Brian and his helper, Ryan, were both very professional, neat and completed our project in a very timely manner. Brian made what can sometimes be a huge interruption in lifestyle a very fun, exciting and pleasant experience. We highly recommend his services without hesitation and look forward to working with him on our next project. If you are in need of a true craftsman Brian is the guy. We had some roof trusses collapse due to snow weight and friends recommended we call Brian. We are so glad we did ! He and everyone did a super job from start to finish. Thanks Brian you are a true pro at what you do .